The California State Athletic Commission has suspended seven “Strikeforce: Diaz vs. Noons II” fighters for various injurious sustained in their respective scraps this past Saturday. 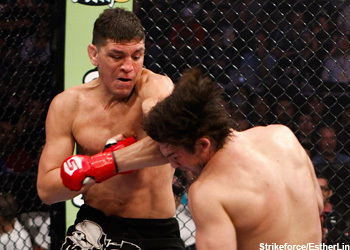 Welterweight champ Nick Diaz used his decisive length advantage to outbox KJ Noons to collect his eighth consecutive victory in the card’s featured attraction. Unfortunately, he was handed a 60-day medical suspension for his troubles. The news was much worse for Noons, Josh Thomson and Gesias “JZ” Cavalcante, as they will be forced to ride the pine for as long as six months. This weekend’s Showtime broadcast took place inside the HP Pavilion in San Jose, California. Nick Diaz was suspended for 60 days with no contact for 60 days due to multiple facial lacerations. KJ Noons was suspended for 180 days with no contact for 180 days due to a left thumb fracture and a left mandible fracture that needs clearance. Josh Thomson was suspended for 180 days with no contact for 180 days for possible right hand fracture and left knee injury unless cleared by a physician. He was also suspended for 60 days with no contact for 60 days due to left and right head lacerations unless cleared by a physician. Gesias “JZ” Cavalcante was suspended for 180 days with no contact for 180 days due to possible rotator cuff tear unless cleared by orthopedic doctor. Andre Galvao was suspended for 45 days with no contact for 30 days due to being knocked out. David Marshall was suspended for 60 days with no contact for 60 days for two facial lacerations unless cleared by a physician. Luis Mendoza was suspended for 45 days with no contact for 30 days due to a hard bout.